Is the Special K diet a dud or the best idea of the decade? Here are the facts. This new diet is also known as the Special K Challenge. The basic idea behind this diet includes eating cereal as a main part of your daily diet to lose weight. For breakfast: One bowl any variety of Special K cereal with 2/3 cup skim milk and fruit. Another meal during your day: One bowl of Special K plus skim milk or they offer a meal solution of their new Special K protein bar. The third meal: Should be your "normal meal." Normal is vague but we'll get to this later. Snacks: Plenty of snacks during the day, as long as they are one of the Special K choice snacks like protein water, snack bars, cereal bars, or snack bites or you can substitute fruit and veggies. See an in-depth view of all the Special K products at their website. Beverages are covered but it simply says, "Drink beverages as you normally do." You also can set up a personalized plan at the Special K website. If it works and you lose weight you will be healthier. Supposedly it does work according to studies on cereal as a weight loss food when used as a portion control method of meal replacement. Special K notes that you can lose one jean size in two weeks and about five pounds. Their weight loss figures are realistic - i.e. it is healthy to lose about 2 pounds a week. If working with a doctor, this diet may be a good solution for kids' weight loss. Cereal; especially a cereal like Special K is a healthy food item. Barring people with food allergies, cereal is a filling and in most cases nutritious meal. Even sugary cereals tend to have values like whole grains, calcium, fiber, and lots of vitamins. Breakfast has been shown to increase your chances of losing weight. Breakfast will boost your metabolism and cereal tends to fill people up until their morning snack plus provides energy. Cereal is not so filling that it makes exercise a pain. You can enjoy a bowl of cereal before a workout and still feel good to go. 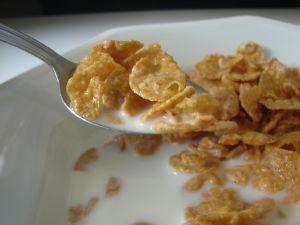 Any cereal diet is lower in fat than most diets because cereal is a naturally low-fat food. This of course takes into account that your planned third meal is not stuffed with fat and that you use skim milk. Cereal can curb cravings. It's crunchy, a little sweet, and tasty - which covers some major craving groups. With ice cold milk it curbs the cold snack munchies as well. This is an easy diet. If you can find an easy third meal it won't get much easier than this. There's hardly any planning involved; you simply head to the grocery store and pick up your cereal, milk, and snacks. Very cost effective. You can't get much better than about four dollars for around 5-6 meals worth of main courses. Cereal is less expensive than just about any other diet solution. The Special K challenge website does not offer enough information to really plan a healthy diet. The worry here is that people will visit the site and try to use this as their only method of diet planning. In their defense Special K notes that one should always check with their doctor before starting a new diet. There's not enough emphasis on exercise. You can lose weight without exercise but it's not recommended. The best lifestyle choice includes both a healthy diet and regular exercise. Many people find cereal filling but some don't and cereal is an easy food to overeat. Water is important while dieting and there's little mention of this at the challenge site. What to do with your third meal is pretty much left up to you. If you plan a third meal at a fast food restaurant then your entire plan for the day can fail since some fast food items contain more calories than one should eat in one day. There are better cereals to eat if you are using cereal as a meal replacement. Oatmeal for instance has more nutrients and is more filling than Special K. If you decide to do a cereal diet be sure to read your cereal boxes at the store for nutrients and calories. You could eat cereal forever; it's way better than a typical American diet. However, do you want to eat cereal for two meals a day forever? How can this diet teach you to cook low-calorie healthy meals? Oh, it can't. The biggest con of the Special K diet is that nowhere on the site does it mention calories or burning calories. The basic calculation for weight loss is more calories out than in. It's that simple. To diet healthfully and successfully you need to know the ideal weight, calorie intake, and the right exercises for your body. None of these things can be learned at the Special K website. Overall there are far worse fad diets you could try. This diet is not dangerous, involves healthy foods, and promotes a healthy body image. To make the most of this diet and to learn about other important weight loss skills the best advice is to work with your health care provider. Use the cereal meal replacement as one support method but also focus on calories, that third meal (make it healthy), and a regular exercise routine. If you add in some extra components then the Special K challenge can be one healthy weight loss solution.